If you spend time outdoors, serve in the military, public service, or have ever neglected your feet, you know how bad things can potentially get. We’ve all see the pictures of destroyed and frostbitten feet from climbers in the Himalaya. Those images of foot injuries are at their worst with lost toes and even amputations up to the knees. If you’ve never seen it, Google “trench foot” and you’ll know it is something you never want to endure. Hands and feet are the first to lose heat do to the bodies physiological response in cold weather. The human body is constantly working to keep a level of homeostasis, but it does have an order of precedence for which organs are of most and least concern. The skin is the bodies largest organ and the one that gets the brunt of blood shunting to keep the rest of your body alive. To keep the core of your body warm, the autonomic nervous system will cause capillary beds in the skin to constrict and thus shunt more blood to the core of the body. Boom, cold hands and feet. First, let’s cover some common problems/injuries caused by cold and wet weather. Then we will discuss some solutions and gear choices to keep your feet health and happy. Common Cold Injuries are exacerbated by wet and moist conditions – water cools more effectively than air at the same temperature. Think of water and sweat as a heat sink. This is when things go numb. This is also that time when you will most likely endure the “screaming barfies.” Frostnip comes before frostbite and will not produce any longterm damage to the tissue or nerves. Once this kicks in, it is important to rewarm the area. Although it may be painful, doing nothing can lead to frostbite and possible permanent tissue damage. Above all, it is just down right uncomfortable. In combination, I’ve felt this extremity affliction more times than I can count and it was usually do to being unprepared. Frostbite, similar to burns, is classified in multiple degrees of severity. Going into great depth of each degree of severity is not within the scope of this article, but we will cover a short description of each. It is unlikely most individuals will ever be exposed long enough to endure a cold injury requiring the removal of dead tissue. Before understanding the severity, it is important to know and be able to reference the different layers of the skin. First-degree: This affects the outer epidermis and region that has direct contact with the cold. The skin will feel numb and have a “waxy” or “plaque” look to it, but there will be no blistering and tissue loss. Healing time is 7-10 days. 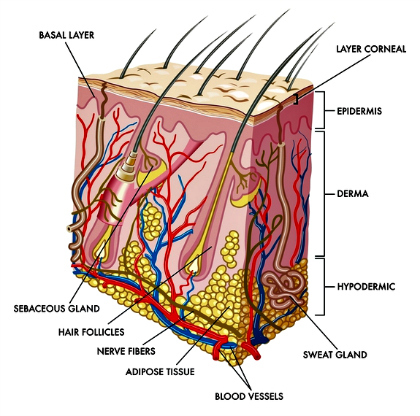 Second-degree: This affects the entire epidermis and the top section of the dermis. The skin and tissue will feel stiff, but you will be able to still feel pressure deeper down. There is no permanent tissue loss, but clear and milky colored fluid from leaking blisters will be present. Healing time is 3-4 weeks. Third-degree: This frostbite effects not only the epidermis, but the full dermis as well. The flesh will be extremely stiff when frozen and show significant swelling with blood-filled blisters. There is definite vascular trauma with slow skin loss, mummification, sloughing. Healing is slow and may take multiple months. Fourth-degree: This will move through the full dermis and through the hypodermis. Muscle and bone will be most likely be effected as well. Due to the depth and severity of damage, no blisters will form and autoamputation will transform slowly. Along with all of these degrees of frostbite is edema. Edema is when localized tissue contains an excessive amount of fluid. Through a non homeostatic process, fluid is moved from inside the cell to the space between each cell, known as interstitial space. You can test for edema by pushing into the skin with your finger. Pitting is designated by barely impressionable to over 30 seconds before the skin rebounds to normal. 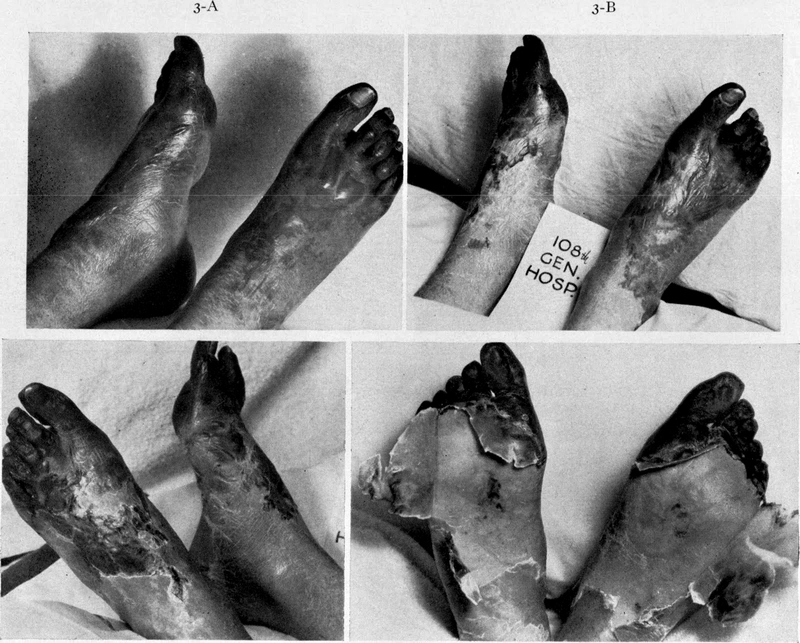 Trench foot is also known as immersion foot and is a nonfreezing cold injury (NFCI). Trench or immersion foot does not require continuous immersion in water, but only a continuously moist environment between 35 and 65 degrees fahrenheit. This becomes pretty easy when soldiers or backcountry adventurers don’t manage their feet. The colder the temperature, the more likely NFCI will have longterm and lasting effects. How do I keep healthy dogs? Most individuals will never endure one of the above cases, but will have moments of severe discomfort that will hopefully make them reexamine foot care. Below are a few steps and pieces of gear I recommend over my years of wincing. Always carry three pairs of socks for an overnight trip or longer. Three is the perfect number because it allows you to easily change socks on the move and still have one pair in reserve. My setup – wear one pair of socks, have other placed in a ziplock or other lightweight waterproof bag, and the other pair is pinned against my chest (this assuming you have already changed socks at least once). Once ringed out, a wet pair of socks can dry within a matter of hours when placed directly against the torso, especially if the wearer is active and creating excess heat. I’ve gone a week in wet Alaska using only two pairs of socks. Alternating “chest dried” with worn. The third pair was an insurance policy and great for resting at camp. Crocs (or similar) are your friend. I can’t believe I’m saying this, and my brothers from Regiment will most likely give me a lashing, but Crocs are some of the best footwear around for river crossings and around camp. They allow your feet to breath at the end of the day (if you’re in a shelter or it’s not raining), they protect your feet from river bottoms, and prevent any additional damage around camp. Thicker isn’t always better. Thick socks are great for around camp, extremely breathable non-waterproof footwear, and inside of a sleeping bag. Anywhere else, and they may do more harm than good. Thick socks soaks up more moisture than a thinner sock. Thick socks also take much longer to dry. More importantly, find socks that work for you. Waterproof is better than not waterproof. This may seem like a ‘duh’ comment, but it all depends on the environment. Airy breathable gear is great for the western deserts and dry environments, but terrible for everywhere else. I love GORE-TEX and all other manner of waterproof barriers. These different companies are always squabbling over which layer is better and trying to one up each other. This is great for the consumer and means things should always be evolving and getting better. Sometimes I hear guys complain about the price of a waterproof boot, so they decide to go for the cheap item. I understand that many people can’t afford the top gear, but footwear is the last place you should try to save money. Waterproof socks (and gloves) are worth the purchase. I’ve never been a big advocate of waterproof socks in the past and always thought the shoe should do the work. When the weather turns really wet and cold, these will do the work. Pair Hanz waterproof socks (made in the USA) with Crocs and you’ve got great river crossing footwear. Get your waterproof socks here. Don’t “Cry Wolf” aka, lie to your partners or team members. If the status of your feet is deteriorating, it is vital to let the group know so something can be done. If you persist it may cause further problems for the team and possible irreversible damage to yourself. When it comes to your feet, being “hard” is just being stupid. GORE-TEX Surround is the real deal. This is a fairly new technology that allows for moisture to move through the GORE-TEX liner under your foot as well. The outside of my Salewa Alp Flow Mid GTX were wet for over a week, but the inside stayed remarkably dry. Down Booties make happy feet. Prior to a weeklong backcountry ski trip in the Eagle Cap Wilderness, I picked up a pair of down booties and have never looked back. The low temperatures ended up down to -15 degrees fahrenheit and I would have had a week of misery around camp if it weren’t for my new purchase. Models range from very basic to waterproof and are fairly lightweight and stuff-able. Buy new socks. Before a long trip or hunting season, buy yourself at least one new pair of socks. Save these for your hardest day. After you’ve been on your feet for hour with a heavy pack on your back, there aren’t many things that feel better than a brand new pair of merino wool socks on your feet. This can be your 3rd pair of socks. Stay Hydrated. When its cold and wet, most people don’t drink enough water and eventually maintain a dehydrated state. Think of your body as a tank. When you are hydrated, your blood volume is full and fills the tank. When you are dehydrated, you blood volume shrinks and parts of the tank will be empty. Compound this with cold conditions when the body is already shunting blood from the extremities and it makes a bad situation even worse. Overall, keeping your feet dry makes it much easier to keep them warm. Investing is footwear that is warm, waterproof, and fits well, is much more important than some fancy gadget. If you are on a budget, wait until last seasons models go on sale. Know the signs of frostnip, frostbite, and NFCI for yourself and anyone traveling in your party. Take a page from the military medics and perform foot checks on each other at least once a day. Now, go have an adventure and keep your feet warm and dry. If you have some magical tips for keeping your feet warm and dry, including gear selection, tell us about it in the comments below or on Facebook.